HANGZHOU - The woman whose efforts cushioned the fall of a two-year-old girl who plummeted 10 floors from an apartment has been hailed the "most beautiful mother" by China's netizens. The toddler, nicknamed Niu Niu, fell around midday Saturday after being left unattended at home in East China's Zhejiang province. Thirty-one year old Wu Juping, herself the mother of a seven-month-old child, reached the falling child in time to break the toddler's fall, preventing the girl from hitting the ground at full force. Wu is now recovering from a broken arm in a hospital that specializes in treating fractures in Fuyang, a city near the provincial capital of Hangzhou. Wu's heroic action has been detailed on popular micro-blogging websites. Thousands of Internet users expressed their appreciation of Wu. "In dynamic terms it would be impossible to catch the child, but in a world with love, everything is possible," said a micro-blog user with the screen name of "pamphlet." Jack Ma, Chairman of Alibaba Group, the company where Wu works, also called Wu a "heroine" in his micro-blog, and the company declared that it would give Wu 200,000 yuan ($30,940) as an award for her good deed. Jin Dengfeng, doctor in charge of Wu's treatment said, since Wu's left arm is suffering from a severe fracture, her forearm could at worst be paralyzed for life. With a smile on her face, Wu said, "A child is of great importance for the happiness of a whole family. For me, any price is worth paying as long as the child could be saved." 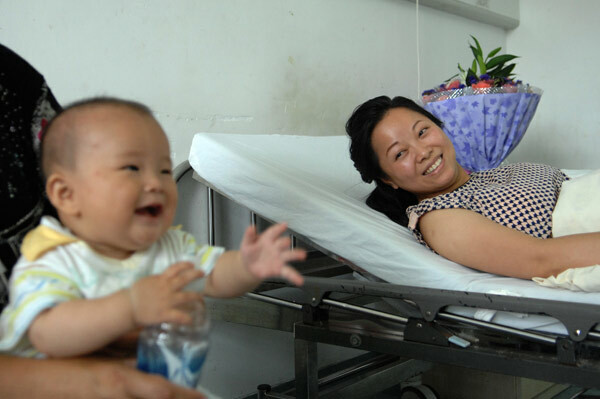 However, Niu Niu is still in critical condition after two days of treatment in Zhejaing Children's Hospital. The girl who suffered from internal bleeding after hitting the ground, is in a deep coma. "Almost all her internal organs are injured, and she is suffering severe concussion," said Zhang Chenmei, Niu Niu's doctor. Zhang is not optimistic. "Whether Niu Niu can finally survive is still unknown," she said. The story has been forwarded by more than 100,000 Chinese micro-blog users as of Monday afternoon. Many people posted online prays for Wu and the child to recover soon.